Well, it’s here. Soccer practices, football practices, first day of school… and (gulp) first, first day of college. My oldest heads to college tomorrow, and we won’t see him until Thanksgiving. Northern Vermont is a long way from southern Pennsylvania. I find myself incredibly jealous (tongue in cheek) of his good fate to be heading to such a wonderful school, in a beautiful area of the country, to do everything he loves. Pursuing a degree he finds fascinating and enjoys, becoming part of the ROTC cadet family, hiking, mountain biking, kayaking, and playing his guitar. Jealous for the outdoor adventures and open life ahead of him, but not sure I’m ready to repeat college test taking! Mostly, proud of how he is steering his own destiny. Tonight, as a send off, we are having one of his favorite dinners. 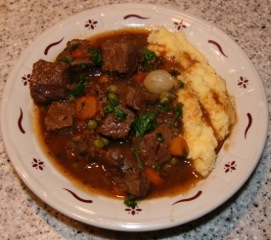 We call it “Stew-Pendous Beef Stew.” It is a fabulous recipe, found by my sister, and tweaked to her liking. She is a wonderful cook, with a year of culinary school to back it up. She then shared it with me. I did a little more tweaking for our tastes, and this is the result. It is the second most asked for dinner at our house, behind “Gratifying Gumbo” (which I will save for a future blog!). It is rather time intensive, but the last three hours is really only monitoring. I do not recommend using a food processor for the chopping; it is better to have uniform cuts. Also, if you can find the time, homemade beef stock is soooo much better. 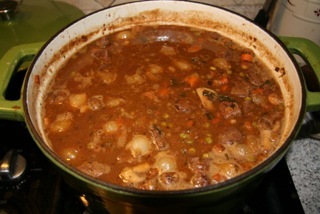 Deep, rich, and complex, it brings another dimension to the stew. I promise you won’t be disappointed! 3 Tbl vegetable oil, more if needed. 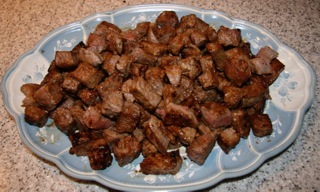 Place beef cubes in a large bowl; season with salt and pepper. Heat a large Dutch oven over med-high heat and add the oil. Brown the meat in batches—be careful not to overcrowd the pan (you do not want to steam the meat)—about 5 minutes a batch. Transfer meat to a platter. Add pancetta to the pan and brown; remove. Reduce heat to medium. Add onion and cook until translucent, 4-5 minutes. Add garlic; cook for another 1-2 minutes, until fragrant. Add carrots, celery and parsley. Sauté until very soft, almost mushy. Add the flour, and stir until the mixture is lightly colored, thick and paste-like. Be very careful not to burn the flour. Deglaze by stirring in the wine and scraping up the bits (flavor!) from the bottom of the pan. All of this chopping is worth it! Add carrots, beef broth, bay leaves, and thyme. Bring to simmer. Add meat and return to simmer. 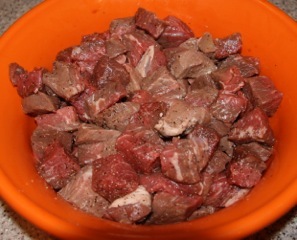 Cover and simmer until meat is tender, 2 ½ – 3 hours, checking occasionally—it should simmer, not boil. 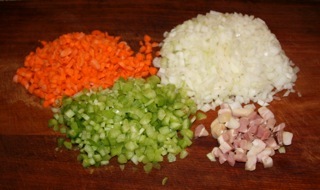 During the last hour of cooking, add the pearl onions, peas, and mushrooms. Stir in ¼ cup of parsley, salt and pepper to taste. Serve over mashed potatoes or polenta, with crusty bread, and a fresh baby greens salad with vinaigrette. This is even better the next day after the flavors have melded. Refrigerate, remove congealed fat from top, and gently reheat. Preheat oven to 450 degrees. Place beef bones, onions, carrots, and celery on a 9×13 roasting pan. Brush tomato paste over all. Bake for 40 minutes, until the bones and vegetables turn brown and caramelize. Transfer all to a stockpot and add remaining ingredients. Bring to boil, reduce heat, and simmer for 4 hours. Add 1-2 cups water if the stock reduces too much. Strain through colander and discard solids. Restrain through cheesecloth. Let cool and refrigerate. Skim and discard fat solids. Freezes well.